The East Branch of the Ausable River runs through our town, and is a prominent feature and consideration in our community’s life. There is a 2 ½ mile walking loop that traverses the River by bridge. When I was young, you could drive across the bridge that spanned the river. It was a ‘rickety-rackety’ bridge, and over the years, car traffic was banned and it became a pedestrian bridge. When Hurricane Irene blew through in 2011, the River flooded in many areas, destroying property and livelihoods in just a few hours. Among the losses was the ‘rickety-rackety bridge.’ It was completely destroyed, a twist of metal beams found downstream in the days after the storm. While the town was working to restore itself in a variety of ways, a small group of people began to investigate how a new bridge could be built to replace the one that was lost. A repurposed bridge was installed in 2015, and the walking loop was open again! There was a festive dedication ceremony, complete with raffle tickets to win the chance to be the first to walk across the new bridge. I walk this loop regularly, and while I am delighted to have this river crossing restored, what stands out to me most, is this. In the middle of the bridge is a bench, with a plaque that says ‘for community.’ Alongside the bench is a snow shovel. In the winter months, when snow is on the ground much of the time, I have yet to cross this bridge when someone has not already shoveled a path. I don’t know who does it; is there one person who does it all or most of the time? Is it the first person who happens to cross just after a snow? I only know how grateful I am to have a path already cleared so I can continue walking the loop. Care for community – which for me is an element of the spiritual life – is visible and enacted around here all the time. I think, when the weather grows warmer, I will stop to sit on the bench, take in the amazing beauty all around me in sight and sound, and give thanks for community. *The Blue Line is the term used in New York state for the boundaries of the Adirondack (and Catskill) parks, within which can be found the state’s Forest Preserve. The state constitution requires that any property owned or acquired by the state in those parks “be forever kept as wild forest lands” and prohibits it from selling or transferring them in any way. It is so called because blue ink was used when they were first drawn on state maps. 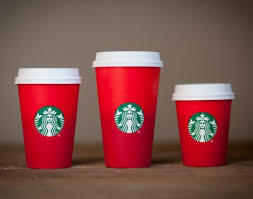 I have watched with curiosity and confusion, at the ongoing commentary about Starbucks’ red cups for the holiday season. To me, they seem attractive, seasonal, and appropriate for the ever-more-diverse population in our society. While I am ordained clergy in the Christian tradition, I am ever more aware that my fellow community members represent a variety of religious and ethnic backgrounds. Is it right that my tradition trumps any other during this, or any other time of the year? As I’ve pondered the expressed outrage about Starbucks’ choice, I’ve been thinking: why don’t we express outrage that other faith traditions are never represented in the public sphere? Why don’t we express outrage that traditions dear to our neighbors who are Jewish, or Muslim rarely get expressed or celebrated by coffee cups or special sales or decorations? And why is it that loud voices from the political and news worlds seem to express either conservative Christian beliefs or no beliefs at all? As I sat with mouth agape and heart broken as news of the Paris murders, now claimed by ISIS, flashed across my smart phone and my TV, I found myself wondering – will this, FINALLY, be the time that we can stop talking about coffee cups and start doing the very hard work of building community with one another to form bonds that connect us through our common humanity? Can we do the hard work of developing ways to talk about what matters to us as individuals, and listen with open minds and hearts, even if we disagree? Can we support political candidates who seek to empower local community, rather than harden the rhetoric of division, debate, and disagreement? How long until we can harness our energy for good, and join together as world community, to stand together against the forces of violence and hatred? What would that be like? How much power and creativity would that generate? This time, we Americans are looking in from a distance. But we are not immune or safe from these same forces. We must look within to our own potential for violence and hatred, and join with one another for support and vision for something better. Please, please. Let’s stop talking about coffee cups. Let’s gather, one by one, a few by a few, and say to one another, and to everyone who will join us – NOW is the time to move in a different direction. NOW is the time to learn and develop ways to live in safe and supportive community; where we listen first and talk later; where we value community before conflict; where we stand together in light of our shared humanity, rather than apart because we have differences.